At Bang Bang Pan Pan it’s OK to play with your food. 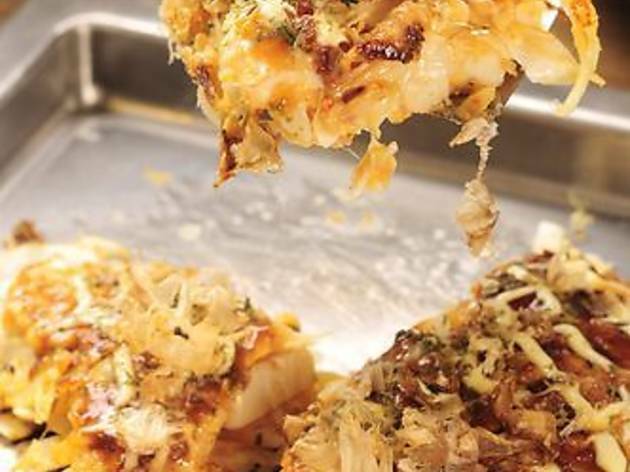 Okonomiyaki, the popular Japanese street food pancake, has been given a punky new home in Causeway Bay, complete with graffiti and a great iTunes playlist. The place is simple, comprising a few tables, each with a central hot plate. It’s difficult to rate this restaurant as all the cooking is DIY. You only have yourself to blame if your pancake doesn’t turn out right. But don’t worry: the owner, who is usually wearing a loud T-shirt, can help the uninitiated. Diners choose whatever combinations of fillings they like. We went for a few combos: scallop with kimchi, pork belly with mushrooms, shrimp and bacon (each costs $40, with prices rising as you add ingredients). You are given bowls filled with your ingredients plus chopped cabbage, onions, and an egg and flour slurry. Mix them together and pour it onto the hot plate. From there you can flip and Jackson Pollock it with sauce until it’s ready. 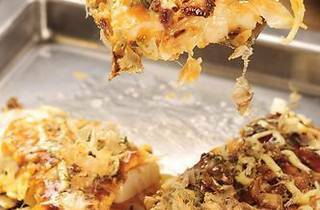 A topping of bonita flakes and a dusting of herbs finish your creation. Does it taste good? Of course it does – you made it. We also tried the chicken gristle tsukune ($36), or chicken cheeseburger as we named it. Two balls of raw meat hit the pan and we were ready to play. The meat is done when the cheese starts oozing out. This chicken meatball is awesome in flavour and concept, and has a delicious bony crunch. The salmon pocket ($48) was just that: a fillet of salmon with sukiyaki stewed onions cooked in tin foil. It was plump and sweet, and we teamed it with a spinach pocket ($19) to add a healthy dimension. Bang Bang Pan Pan is just plain fun. Bring a small party, settle down with a few beers and remember what it’s like to play with your food. Meal for two: around $250.